The sell-out success of this years’ Creamfields Presents Steel Yard meant that many of us were left with no choice but to jealously watch the show from our sofas, flicking through video after video of utter party paradise from revellers who were lucky enough to be there. But fear not, festival lovers! Steel Yard is back and ready to go with plenty of room for everyone, including you! 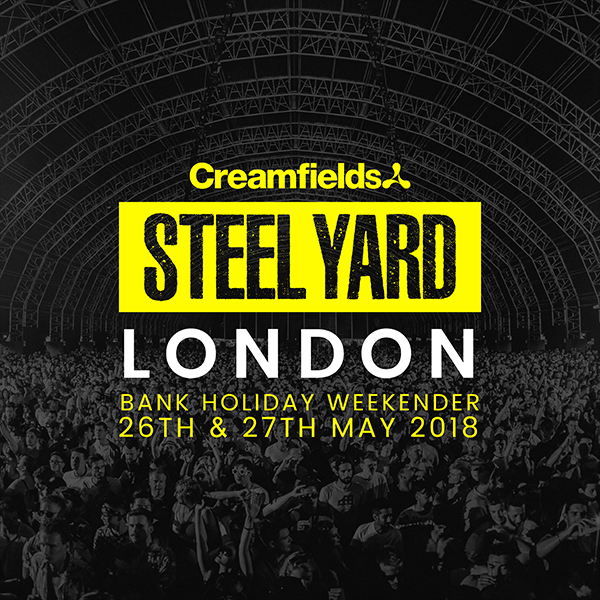 After enjoying sell-out shows from Liverpool to London, the Creamfields’ Steel Yard is back in the city, promising unforgettable performances from some of the industry’s most highly anticipated acts. Famed for its mesmerizing light shows, unbeatable special guests and frankly, being a party like no other, the Steel Yard is an event that just keeps getting better and better, and we’re sure that this year is no exception. Good news! There’s no overly-long wait for this one, and no trying to cram another festival into August’s already jam-packed festival schedule (not to mention trying to get the time off work!). The Steel Yard shows will take place across May’s Bank Holiday weekend, on the 26th and 27th to be precise, so get those dates in your diary (or write them on your arm, whatever). We’ll keep our fingers crossed for warmer weather as by then summer will almost be in sight! But no promises, this is the UK after all! The Steel Yard will be taking over London’s very own urban idyll, Finsbury Park, making an awesome- albeit temporary- addition to the capital’s iconic skyline. The superstructure, fit for 15,000 partygoers no less, has reached the record-breaking heights (quite literally) of being the largest of its kind in Europe, paving the way for festivals and concerts alike. Designed and created exclusively for Creamfields, featuring cutting-edge technology and pioneering production, the Steel Yard has provided a truly unique and electrifying addition to the festival calendar, revolutionising the experience for lovers of electronic music. This is the best bit! Organisers have left no room for disappointment with this ground-breaking line-up! Headlined by two of the world’s biggest EDM acts with plenty more performers still to be announced, this is a show that even your dad would enjoy (although he probably wouldn’t admit it!). Kicking things off on Saturday night is trance music group, Above & Beyond. After being the first British DJs to sell out Madison Square Garden (firmly securing their place in the music hall of fame) this trio of talent are taking things to a whole new level at Steel Yard 2018, which will take the title of their biggest London show to date. Be there and see them make history! News flash: Sunday is no longer the day of rest, especially if Tiesto has anything to do with it! That’s right, Sunday will see one of house music’s most respected and sought-after artists take to the stage, ready to blow the minds of all in his presence. This DJ/producer/all-round powerhouse is regarded as being one of the leaders of the electro movement, steering dance, trance and other progressive genres into mainstream music, something we are truly grateful for. As if these massive names weren’t enough, Steel Yard will be their only UK performances of 2018, so don’t hang about! It’s easy! Tickets go on sale here www.creamfields.com/steelyardl ondon from 9 am on Friday 10th November, and if previous shows are anything to go by, it’s sure to be a sell-out. Don’t be put off by the early start: set an alarm, get your tickets and you can rest peacefully knowing that you are soon to have the best experience of your life. Yes, I’m talking about Steel Yard! See you there!